Hubert von Herkomer rose to prominence in the 1870s as a leading proponent of social realism in England, influenced by both the anecdotal and picturesque styles of the German ‘village tale’ painters (such as Franz von Defregger and Wilhelm Leibl) and English idealism in the vein of Frederick Walker. Herkomer founded the School of Art at Bushey, Hertfordshire and became the Slade Professor of Fine Arts at Oxford, 1885-94. ‘It always gets worse and never gets better’ (‘Immer wird schlimmers und besser wird nimmer’) is an example of Herkomer’s Bavarian peasant scenes, made during a particularly intense period of interest in the simple dignity of country life. The artist spent a few months of each year from 1871 until his death in the Bavarian alps, with the primary aim of experiencing peasant life and using those around him as models for his art. During these visits he created numerous etchings, watercolours and paintings in oil of Bavarian life for English audiences, either for exhibition in the UK or reproduction in The Graphic magazine. 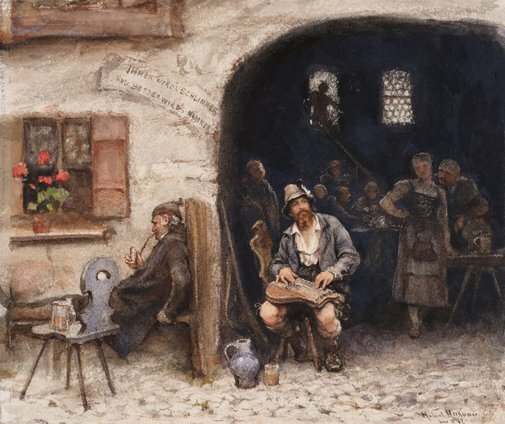 This watercolour was painted in Ramsau in June 1877 during one of his annual sojourns to the area. The central seated figure depicts Herkomer himself, playing a zither and immersed in the idyll of his chosen lifestyle. The inscription ‘Immer wird schlimmers und besser wird nimmer’ near the arched entrance to the tavern, derives from a German proverb and translates: ‘It always gets worse and never gets better.’ In keeping with Herkomer’s recurring motif of the inevitability of death and decline, the inscription is most probably intended to make a literal association between the contemplative figures of Herkomer and the elderly man seated to his left. ‘It always gets worse and never gets better’ relates directly through composition and subject to the drawing Tyrolese bowling alley, purchased by the Gallery in 1880. Both works were made whilst Herkomer was creating his celebrated watercolour Light, Life and Melody of 1877-79, and may be seen to inform this later, larger work. Signed and dated l.r., pen "Hubert Herkomer/June 18 77"
Michael Crane, 2014, Edgecliff/Sydney/New South Wales/Australia, Gifted to Michael Crane by Dr Lee MacCormick Edwards. Considered item to be gifted to the Gallery. Herkomer: A Victorian Artist , Aldershot, 1999, p 63, no 68, col illus p 63. Hubert von Herkomer, C.V.O., R.A. A study and biography , London, 1904, p 117.